In the new 2016 collection, the company takes a step back towards the roots of its original Big Pilot's Watch and has given the Big Pilot's Watch (Ref. IW500912) a discreet optical makeover. The triangular index has been returned to its original position below the chapter ring, thus making it more prominent, and the "9" also returns to its original position. Apart from this, the numerals appear a little bolder and the 5-minute markings slightly slimmer. Overall, the dial appears more harmonious and is uncannily similar to the 1940 original. The Big Pilot's Watch comes with the tried and tested cockpit design, which was inspired by the 1940s models, when the watch was an indispensable aid for pilots when navigating. Cockpit instruments are well known for being simple and offering optimum legibility. A perfect example of this is the cockpit of the Junkers Ju 52. An engraving of the legendary aircraft graces the back of the Big Pilot's Watch and reminds us of a legend that lives on in the current Pilot's Watch collection. The Santoni straps are made of black calfskin and the perfect complement for the watch. 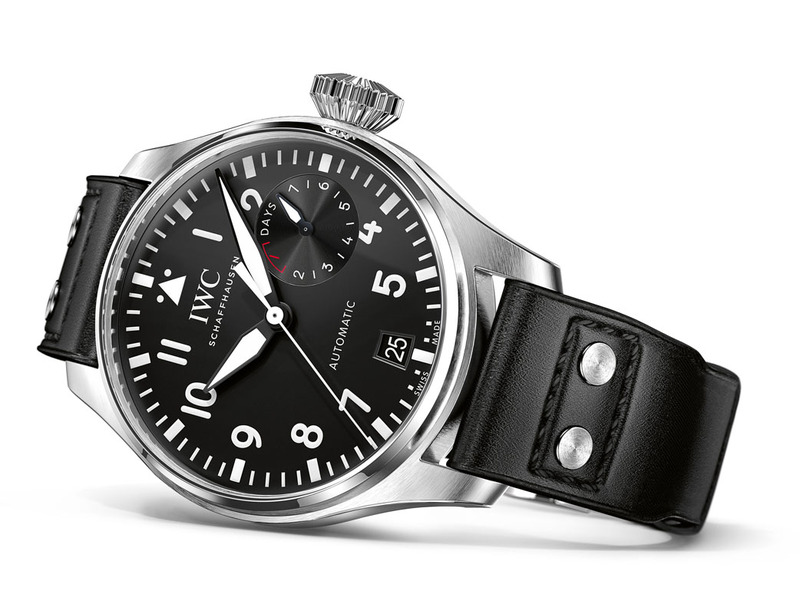 With this Big Pilot's Watch, IWC uses the calf- skin strap produced by the shoe manufacturer for the first time ever. The IWC-manufactured 51111 calibre unites some of the greatest achievements in the art of watchmaking. Within no time at all, the spring-mounted rotor and Pellaton pawl- winding system build up a power reserve of over 7 days. The power reserve display at "3 o'clock" informs the wearer of the time remaining until the movement comes to a stop. The Big Pilot's Watch has a date display at "6 o'clock" and the central seconds that is indispensable for aviation naviga- tion purposes. The original timepiece, the Big Pilot's Watch (52-calibre T.S.C. ), even bore the designation "Seconde Centrale" (S.C.) in its name. The 46-millimetre case, water- resistant to 6 bar, encloses a soft-iron inner cage that protects the movement against magnetic fields. 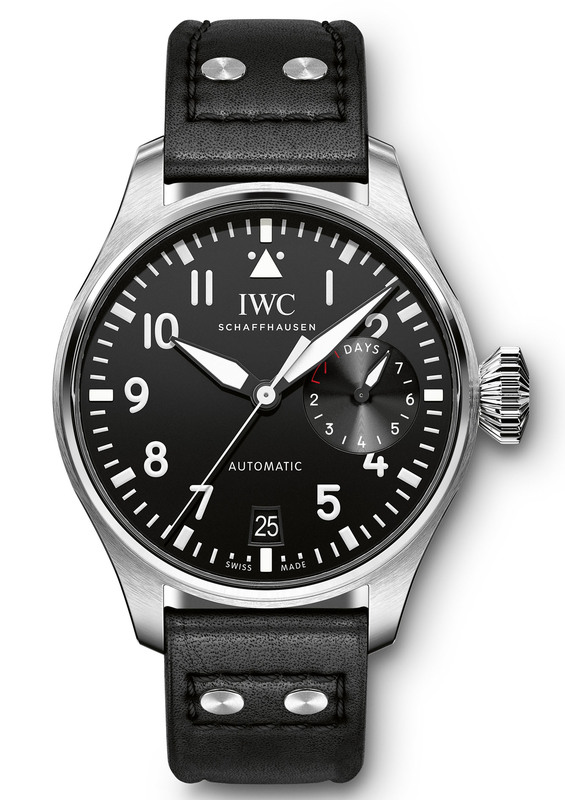 Apart from this, the Big Pilot's Watch is equipped with a striking cone-shaped crown, harking back to those pioneering days of aviation when pilots were obliged to set and wind their watches while wearing gloves in unheated or open cockpits. The case, in stainless steel, measures 46mm x 16mm. It has an AR-coated sapphire crystal and it is water resistant to 60 meters. Soft-iron inner case for protection against magnetic fields Screw-in crown Glass secured against displacement by drops in air pressure Special back engraving. with 42 jewels, 21,600 vph and a power reserve of 7 days. It has the Pellaton automatic winding system Power reserve display Date display Central hacking seconds Glucydur beryllium alloy balance Breguet spring. It comes on a black calfskin strap made by Santoni with a stainless-steel folding clasp.